If you are a proud home owner you are always looking forward to ways to improve the look of your residence. This can be as simple as a lick of paint on the wall or sanding and staining a deck or door. What most people do overlook is there garage; it’s one of those places that gets filled with junk with just enough room to squeeze the car in. But did you know the garage has become a major selling point for people when buying a new home. Your car is the 2nd most expensive purchase you will buy so more and more people require a nice place to store it and work on it. The floors will be resistant to mold, fungus and odor. The floors will protect against bacteria and other nasty microbes. You will be able to sweep and mop the floors easily. 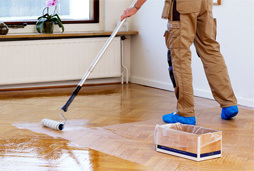 If your car leaks oil it can be mopped up while not staining the floor. It is water proof so the floor will not weather. There are no places for insects to hide because it’s a seamless and flat floor. The floors will be tough so if you drop anything the floor will be protected. Aesthetically the floors look fantastic and can be customized with different looks. It really does make sense to install epoxy flooring because the price point is really good considering the look you get and the amount of work our guys put in to give you a complete floor redesign. If epoxy flooring is not the look you want then we have some other options that will suit you. Polished concrete is a very easy process that can provide a real nice seal that will reflect light back off the floor to lighten up the garage. "I had epoxy flooring installed in my business, owning a hair salon I wanted something that was easy to clean and bacteria free. The guys came in mid week and added this amazing red metallic reflective finish which looks amazing. All my customers comment on how cool it is and it’s easy to sweep and clean at the end of the day. I am really happy with it." "We own a small chain of organic food shopping centers and I wanted a quote on one of my stores to see how much it would cost and how it would look. The team that came out was great and they showed me options and I went for a polished concrete look that also makes the floor look vintage. I was stunned by the result it made the store look amazing and the produce now feels like it’s sat on a stage. I have given the green light to add it in our other stores." "My home garage was looking very sad and I wanted to upgrade it so I can work on my cars and be in a nice environment seeing as I was spending hours in there. I picked out a cool metallic blue flooring option that is just, wow! Now my wife has to drag me bag in the house because it’s made my man cave complete. " "I just want to say that this company helped me pick out the floor that would define my place of work. My factory is now cutting edge in every way thanks to the advice of these professionals and I have secured many manufacturing contracts since due to the professional look of my facilities and the overall finish of the factory." Resin based epoxy flooring coatings as well as other flooring solutions. Different sealants to protect against inside and outside environments. Design advice on the best finish to suit your home or commercial setting. Full inspection of the floor and patching of it before any finish is applied. We have trained and licensed team members to perform the work.